In the Andrew Tesauro Special Care Nursery at Abington Hospital, babies with special needs receive the highest level of care. 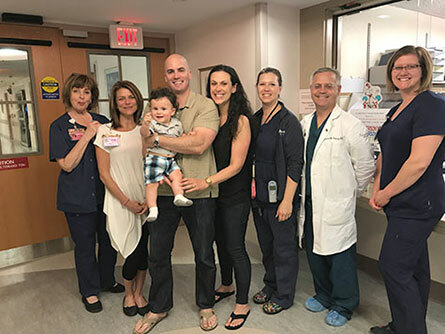 If an unexpected problem should occur, such as premature delivery, the Neonatal Intensive Care Unit (NICU) staff is trained in developmental care of pre-term infants. The 34-bed nursery includes the NICU and Continuing Care Unit. Each unit has a dedicated nursing station and sophisticated technology for caring for high-risk and premature infants. Since nothing is cuter than babies, especially babies swaddled up in KicKee, we sent the NICU more than 300 of our favorite baby items, including bibs, loveys, footies, coveralls, layettes, PJs, hats, swaddles and even some KicKee Press books and plush toys, as well as tops, bottoms, rompers, dresses and more for the kids of varying ages on their pediatric floor! Abington – Jefferson Health is the organization that encompasses its flagship hospital, Abington Hospital in Abington, PA and Abington – Lansdale Hospital in Hatfield Township, PA, as well as a number of convenient outpatient settings for obtaining expert medical care. It now includes 14 hospitals and more than 50 outpatient and Urgent Care Center locations located throughout Philadelphia, Bucks and Montgomery counties in Pennsylvania and Camden and Gloucester counties in New Jersey.